Save the Date: June 16, 2016, 6:30 P.M. to 8:00 P.M. for the Nottingham Drainage and Paving Project (CIP # M-000247) Pubic Engagement Meeting. We are still attempting to secure a location that is convenient to the adjacent neighborhoods but not in the middle of the ongoing Memorial Drive construction project. This project will provide flood relief for the areas shown below in light blue, and will reconstruct Kirkwood to current design standards from Memorial Drive on the south to Britoak on the north. 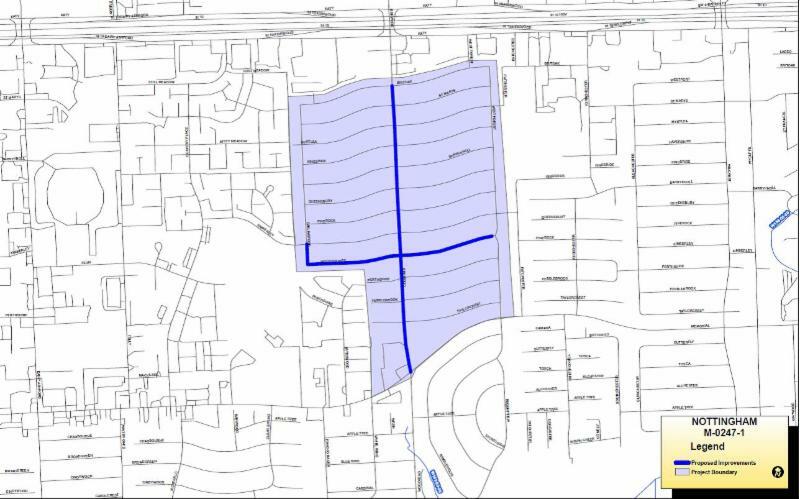 Large storm drainage infrastructure will be installed under Kirkwood and under Woodthorpe from Carlingford to Westforest as shown below in dark blue. Please save the date and plan on attending this informative meeting if you are in an area that will be affected. More information together with the location of the meeting will be distributed in the near future.